Recommended Audience: CIO, CFO, Procurement officers, IT Finance, IT Sourcing. Telecom Expense has traditionally been the most challenging of IT costs to manage. With the emergence of Software-as-a-Service, Cloud Computing, the Internet of Things, and software defined networks, the rest of the IT world is quickly catching up. 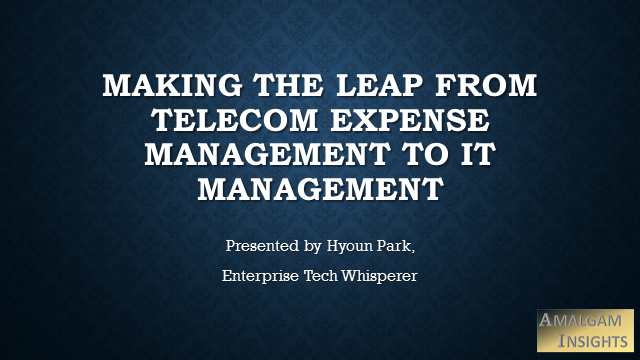 This webinar will provide best practices for expanding your existing telecom expense management program into a bigger IT management program to take advantage of the robust capabilities and vendor management experience already in TEM. This presentation will include anonymized end user examples and a list of vendors with experience in managing non-telecom expense categories. Cloud, telecom, & mobility costs overwhelmed unprepared IT teams in 2018 with unbudgeted surprises. To avoid these costs at a time when the need for IT is growing rapidly, Amalgam Insights provides 7 trends and recommendations to counteract these challenges. This webinar is a short introduction designed for IT professionals who are exploring Infrastructure as Code especially focusing on SysOps, managers (from mid-level to C-Suite), and system architects. As modern IT systems become more diverse and complex, managing them, especially at scale can become very difficult. Infrastructure as Code present a new way of thinking about infrastructure management that alleviates many of these challenges. •Writing Infrastructure: An introduction to Infrastructure as Code and the ways it alleviates some of the problems of managing diverse, hyperscale, multi-cloud systems. By attending this talk, you can bring back to your organization a better understanding of how psychology and brain science can be leveraged to provide a roadmap for successfully training leaders and managers at all levels. In this era of digital transformation, where organizations rely increasingly on cross-functional and deeply collaborative teams, leadership is becoming more distributed and employees are taking on leadership roles much earlier in their careers. Combine this with some of the recent corporate crises (#metoo, unconscious bias, discrimination) and effective leadership training becomes even more important. The overriding aim of this talk is to examine leadership training and development from a learning science perspective—the marriage of psychology and brain science—and to identify procedures that optimize leadership training. All too often, L&D vendors offer a plethora of tools with no guidance on when to use which tools. The result: weak adoption and sub-optimal learning and performance with no clear path forward. This talk briefly reviews the plethora of exciting new technologies on the L&D market, the psychology and brain science of learning, and a set of best practices for mapping these technologies onto representative learning problems. First, we start with a quick tour of the array of technologies available to L&D professional. Next, we offer a primer on the psychology and brain science of learning and discover the multiple distinct learning systems that have evolved in the brain to learn different skills. We conclude by providing an example of an effective mapping from learning tools to learning problem that derives from the learning science. By attending this talk, you can bring back to your organization a better understanding of how psychology and brain science can be leveraged to provide a roadmap for successfully training employees. How do you know if you are outsourceable? And how can you guide the outsourcing without simply being replaced? This webinar takes the analyst's experiences in IT, examples from current IT organizations and managed mobility service providers, and key trends in the IT world to show when and how to identify IT jobs ripe for outsourcing and how to position yourself to take advantage of the outsourcing rather than simply be replaced. Recommended Company Size: $10 million to $1 billion in annual revenue or companies growing more than 100% year-over-year. Summary: It's easy to lose control of IT costs when companies grow quickly. Those that lose track of IT costs will give up valuable funds that could be used to hire talent or acquire key assets. In this webinar, Amalgam CEO and Principal Analyst Hyoun Park and Telecom Expense Management vendor Valicom explore 5 big warning signs that company IT spend is going off the rails and then how to fix these issues via either a software, back office support, or managed services solution. IT is broken. Bad data assumptions, legacy technology, poor business decisions, and weak IT management have changed IT from a superstar to a second-rate department that struggles to maintain its seat at the CEO's table. With AI, personal data, & business ethics all in ascendence, the need for ethical IT policies has never been greater. Otherwise, companies risk building services and products that fall short of the ethics and trust that they have been given by employees. In this webinar, Amalgam Insights explores how current data, BI, analytics, and machine learning technologies threaten ethical IT and provides guidance based on other rules-based frameworks that derive business outcomes, such as the law and corporate legislation. Cloud Infrastructure-as-a-Service is growing rapidly as companies replace obsolete data center servers and storage with "The Cloud." As companies use more services from multiple regions and even multiple vendors, Cloud Computing becomes yet another management headache where discounts, service levels, and IT governance can go unenforced. In this webinar, Amalgam introduces a new set of solutions focused on enterprise SaaS expense management, a $40 billion+ global market that is largely unmanaged at this point. Amalgam estimates that less than 5% of SaaS spend is currently centrally managed. The other 95% is hiding in expense reports and one-off accounts that escape corporate control. No rules, no buik discounts, no disputes, no contract enforcement or negotiations. Stop the insanity! Learn which vendors to consider to manage an expense that may now represent $5,000 or more per employee in your organization. Role-Based Expert Enhancement Platforms (REEPs) are the future of embedded Artificial Intelligence. Amalgam Insights believes that the key to success for artificial intelligence is embedded AI aligned to role-specific and industry-specific challenges. The goal is to provide focused outputs that enhance the best judgment of subject matter experts. This leads to a core mission of Amalgam Insights: improving the consumption of enterprise technology. Based on interviews with dozens of enterprise application platform users, application vendors, and machine learning providers, Amalgam Insights described how lessons from embedded BI and application analytics can be used to create the next-generation of embedded AI and embedded machine learning applications. Recommended Audience: IT finance and budget managers, telecom expense directors and managers, cloud and software sourcing managers. AI presents a framework for managing cloud, telecom, and software consumption in a Hybrid IT world. A must-attend for IT executives managing multi-million dollar cloud, telecom, mobility, and/or software budgets. This webinar will include descriptions of each of these toolkits, anonymized business examples, and representative vendors to consider at the enterprise level. Amalgam Insights bridges CIO & CFO gaps in purchasing technology and taking full advantage of data for machine learning, applications, and building smarter brains.